Click HERE to learn about our 45/82 Society, which honors planned givers. Americans are well-known for volunteering their time and other resources for the benefit of causes in which they believe. As a result, all our lives are enriched. Many people also choose to extend their charitable interests in their long-range financial planning. The Last Will and Testament is one of the most popular vehicles for making long-range gifts. A will is a legal document that protects your assets and helps minimize the chances of a contest over your estate. If you die without one, your estate will be distributed according to a rigid legal formula and not as you may have wished. 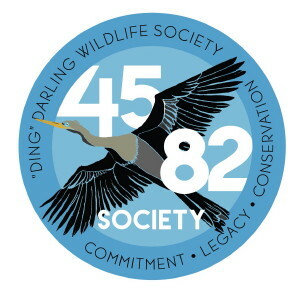 “Ding” Darling Wildlife Society (DDWS), the non-profit friends group supporting the J.N. “Ding” Darling National Wildlife Refuge, is proud to be mentioned in many of our departed benefactors’ Last Wills and Testaments. It’s quite simple to do. The IRS has granted DDWS tax exempt status, and any gift to our organization is tax-deductible and will help offset inheritance taxes your family or friends might otherwise be obligated to pay. If there is a specific area of DDWS you would like to support, it is important to us that we meet in person or over the phone to establish a “gift agreement” that clarifies your intentions, so that when your gift is realized, DDWS will also know how you would like it to be used. DDWS’ Legacy Society recognizes those friends who have chosen to honor the Refuge with a planned or deferred gift. By creating a personal legacy, you also create a lasting legacy for DDWS. Your gift through your will, large or small, is critical to the Refuge’s future survival. We would like to recognize you as a member the Legacy Society, unless you prefer anonymity. To become a member of our Legacy Society and receive special invitations to events and special recognition in our newsletters, please contact the Society at 239-292-0566 or by email. A carefully prepared will or estate plan is the best way to ensure that your loved ones are provided for after your death, and that your preferred charities are supported as you intend. Just as charitable deductions during your lifetime can produce sizable savings in income taxes, donations made at the time of your death can materially reduce estate taxes. Charitable bequests are deducted in full from the value of your estate in the calculation of estate taxes. Specific Bequest — The most popular type of charitable bequest, a specific bequest provides that DDWS receives a specific dollar amount, percentage of your estate, or piece of property. Residuary Bequest — A residuary bequest provides that DDWS receives all or a stated portion of your estate after all other bequests, debts, taxes, and expenses have been distributed. Contingent Bequest — A contingent bequest can ensure that if circumstances make it impossible to carry out your primary provisions (as when your spouse or other heirs do not survive you), your assets will then pass to DDWS rather than to unintended beneficiaries. Trust Under Will — You can bequeath a portion of your estate to be held in trust for a specified purpose, as stated in your will. Qualified Terminable Interest Trust - This is used when you wish to make a gift and at the same time provide for your spouse. The trust is set up in your will. Upon your death, the income goes to your spouse for life; after your spouse’s death, the remainder belongs to DDWS. The arrangement allows the property to be completely free of estate taxes. DDWS recommends that you consult with estate planning, legal, and accounting professionals to determine the proper gift vehicle that best fits your tax and financial interests. For more information, call DDWS at 239-292-0566 or click HERE to email.